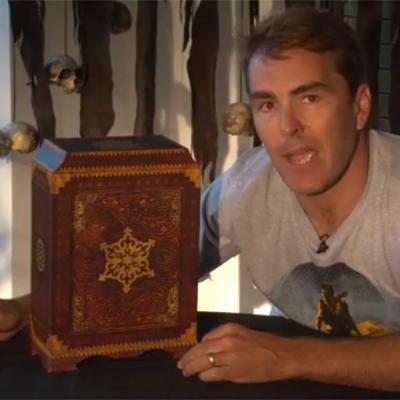 Sony and the PlayStation.Blog have gotten together with Naughty Dog and the voice of Nathan Drake, Nolan North, to unbox the Collector's Edition of Uncharted 3: Drake's Deception. Three minutes of video delivers the details of the package and a healthy heap of Nolan North's uncanny sense of humor. Plus, it feels like it's being unboxed by Nathan Drake himself at times. Sign me up for that video. The Collector's Edition will retail at $99.99 when the game releases this fall. It includes a unique reproduction of a travelling chest, an eight inch figure of Nathan Drake, a replica of the belt buckle Drake wears in Uncharted 3 and a replica of the ring featured prominently around Drake's neck in the game. Both replicas are wearable, if that suits your fancy. PlayStation.Blog also indicates that Sony will be present for PAX Prime this weekend. If you're at the show, you can stop by their booth and see the Collector's Edition of Uncharted 3: Drake's Deception with your very own eyes. Will Nolan North be there to demo every bit of it for you? No. He won't. That's just looney. Uncharted 3 is due out exclusively for the PlayStation 3 (of course) on November 1st in North America. As the game's launch date approaches, we'll have more coverage as it becomes available.